The Tannenhof guesthouse is located in a quiet and sunny position, from where you can enjoy a wonderful view of the gorgeous mountains and orchards of Lacies/Latsch. Here you will find a lovely and comfortable atmosphere, a wide garden, a sunny terrace and a large car park. Family-friendly Pension & Residence in a beautiful location, with indoor pool, spa, lawn and garden area and breakfast buffet. If you appreciate hospitality in a convivial atmosphere, if you enjoy relax then welcome to the Residence Obkircher, your home while you are on holiday. 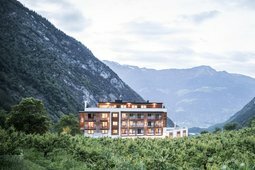 The Activ Resort Bamboo is located in the heart of the Venosta Valley in South Tyrol, between Merano and the Austrian border. It offers a nice and cosmopolitan atmosphere, combining Tyrolean traditions with the spirit of Asia. The Val Martelllo lies in the middle of the National Park Stelvio and is a real hiking paradise: discover nature, hike from the valley to alpine pastures, mountain huts, glaciers and the top of mountains! The valley is also famous for its delicious strawberries. 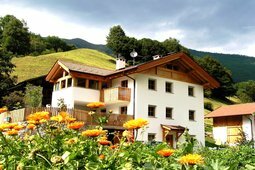 Residence Alpenrose welcomes its guests in an inviting house, located on the sunny side of Val Martello. Rest and relax, enjoy the panoramic view of the valley and the surrounding mountains in the fresh air... everything is waiting for you here. Every day will be special. 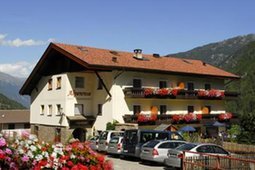 Welcome to the Martellerhof in Val Venosta! Here you will find an amazing mix of South Tyrolean nature and hospitality. During the summer you can take long walks or organise excursions in the Stelvio Natural Park. 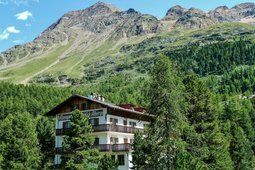 The apartments Mairulrich are located at 1310 meters above sea level, in a central and quiet area in the Stelvio National Park. The house is the starting point for hikes in the mountains. 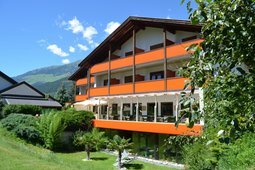 The bus stop is 50 m away and shops and restaurants are at about 400 m.
Welcome to the Residence Pension Obstgarten in Goldrain, near Laces. 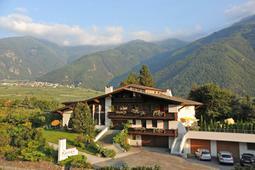 The house is located in the heart of the Vinschgau, between the city of Merano and the Reschenpass. 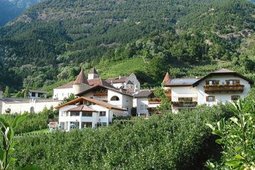 The family Gluderer invites you in this very calm environment of orchards in the sunny Vinschgau. Distant only a 5 minutes walk from the centre, this Garni is located in the middle of fruit orchards and majestic mountains, in a quiet place. 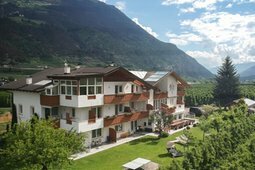 Right outside the hotel door you will find a beautiful mountain panorama: mountain air, pure water springs, green meadows and the sound of cowbells. In winter the landscape changes completely: snowy peaks, frozen waterfalls, forests dressing a white coat and a clear blue sky.